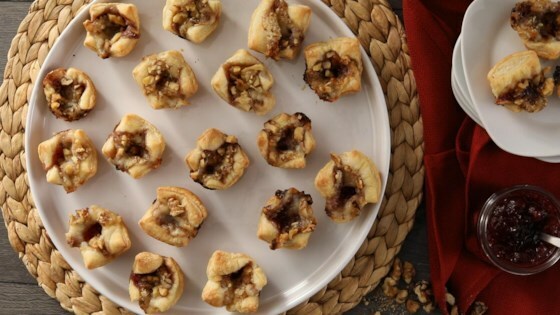 "Tangy cranberry, creamy brie, and crunchy walnuts come together in a buttery shell for an appetizer that will wow your guests. Bonus: These can be made up to 3 days ahead; wrap them in plastic wrap before the baking step and store in the refrigerator. Serve warm or at room temperature." Place Brie cheese in the freezer for 20 minutes. Oil a mini muffin pan with cooking spray. Roll 1 puff pastry sheet out into a 10x14-inch rectangle. Cut the sheet lengthwise into 4 even strips and crosswise into 6 even strips; there should be 24 squares. Separate and press them gently into the muffin cups. Cut chilled Brie cheese into 24 pieces approximately 3/4-inch in size. Add 1 teaspoon cranberry sauce to each pastry-lined muffin cup; press in 1 piece of Brie and top with 1 teaspoon of chopped walnuts. Sprinkle bites with sea salt. Chill for at least 30 minutes and up to 3 days. Bake bites in the preheated oven until golden brown, 18 to 20 minutes. Placing the Brie cheese in the freezer for 20 minutes makes it easier to cut. AMAZING recipes. I made these for Thanksgiving as an app. My family thought they were super fancy and delicious. Used raspberry preserves instead of cranberry sauce. Also tried bacon and egg. I would cook them a bit longer and roll the dough a bit thinner. The pastry tastes better and the texture is better if a bit crispy. These were easy and awesome! Will certainly add them to my favorite holiday appy list!